Atlantis Resort Bahamas is a great (and huge) place to go on a vacation. There's a lot for the family, boaties and everyone else really. Below we've outlined what you'll find here as well as the different accommodation towers. Each type of accommodation is booked separately and they also rated by past guests differently. Great news! The Atlantis has a travel deal going. Click here to take a look at the deal - $299 per person per night. There are blackout dates so get in quick to choose the dates you want. The Atlantis Resort hopes to submerge you into the Myth of Atlantis. It's full of creatures and lagoons to give you this feeling as well as a ton of activities to keep you entertained and relaxed. We've featured it because there's so much to do, it's gorgeous and it's huge. 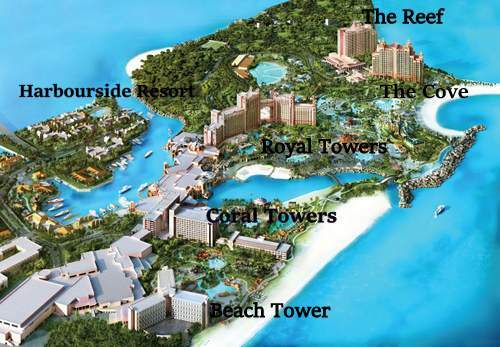 Recent and Current Atlantis Resort Deals. 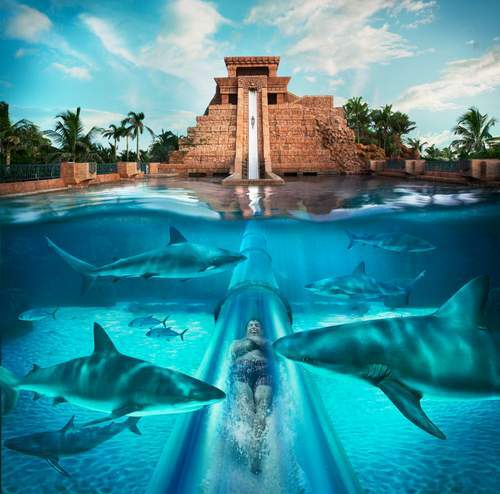 New Atlantis All-inclusive Experience this Fall! Rates from $299 per person per night! day for amazing specials at Atlantis! Save 65% + $350 instant airfare credit & free dolphins, golf, and more! 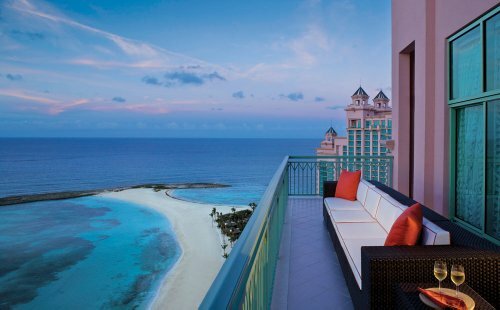 Save BIG on Spring Break at Atlantis Resort! Save up to 50% with Air-Inclusive Reservation PLUS Receive up to $450 Resort Credit! See the Atlantis deals here. Waterpark: there are lots of waterslides and rides.You don't have to leave the water to line up - there are "water elevators". 14 lagoons with fish and sea creatures. 20 swimming pools: childrens, family, lazy river, waterslides. Water sports including snorkeling and kayaking. Full-service spa: it uses Balinese, European and natural Bahamain elements. Sauna and Health Club. There's also 18-hole championship golf nearby. You can use a complimentary shuttle to get between towers and different activities. There are quite a number of restaurants and cafes with all different different styles of cuisine. There are 10 gourmet restaurants, 7 casual restaurants, 3 buffet restaurants and 9 cafes and coffee shops. You're sure to find restaurants you like. There is a range of accommodation options at Atlantis. All you need to do is pick what is right for your situation. There are a total of 3164 guestrooms in a variety of locations at this resort! The Atlantis Beach Tower is the least expensive with 423 rooms. It's in the most tranquil location, is close to the beach, has a teen center, a comedy club and a movie theater. It receives a mix of fantastic and okay reviews. They are usually good though. Reviews for the Beach Tower and other options listed below. The "crown jewel" of the resort is the Royal Towers. Centrally located, it has the casino, lagoon, water park and 11 pools included. The guestrooms here have half balconies views of the water, terrace or harbour. "Guests are immersed in a one-of-a-kind celebration of the Atlantis legend"
The Coral Tower has a 2-story library with computers and Internet access. Guest rooms are contemporary and relaxed with private balconies. It's family friendly and mid-range in terms of price. The Reef Atlantis is suites, studio apartments and penthouses. The Cove is all suites, 5 star, private, sophisticated and exclusive. The adults only ultra-pool is included here. Harborside Resort At Atlantis is an all villa resort. You can choose between 1, 2 and 3 bedroom villas. Great for families or small groups. The resort website is the best place to get more detail on the accommodation options. 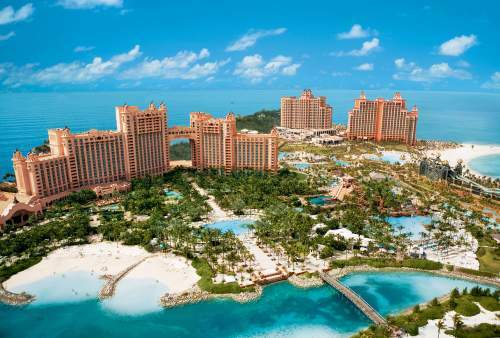 Save up to 65% plus get a $350 instant air credit at Atlantis, Paradise Island, Bahamas! Want to see some more resorts in the Bahamas? Click here to see the luxury resorts in the Bahamas or Bahamas Family Resorts.